Finding it hard to sleep at nights? Can’t find a comfortable position that can accommodate your baby bump? Are you waking up with pain in your back and pelvic area and having other sleep related issues? Many women even from the early stages of pregnancy are finding it difficult to get a good night’s sleep. They can’t seem to find the position that is comfortable for them and their baby in the tummy. Many have resorted to propping themselves with extra pillows, against the back, under the tummy and between the legs just to get a comfortable sleep. The thing is, as soon as you try to turn to a new position pillows are all gone or misaligned, forcing you to get up and start your propping all over again. Your other half may even find sleeping with you during this time a bit tedious as you become fidgety and restless. This is where a pregnancy or maternity pillow comes in handy. Why Should You Use a Pregnancy Pillow? Pregnancy pillows were designed to help expecting moms have the required support thus achieving a more comfortable night’s sleep. They are adjustable, have varying levels of firmness, sizes, shapes and forms. Many women have had positive reviews of using pregnancy pillows referring to it as “Godsend”, which conforms to the shape of their bodies. An investment in a pregnancy pillow replaces the need for the number of pillows one would normally use to get the support needed. Having the perfect support during sleep will most certainly eliminate the painful sensations you’d normally experience in the mornings. You will achieve a more restful sleep which is very important for you during pregnancy. Your other half would also appreciate the fact that you’re not twisting and turning for the entire night, however they might find that the pregnancy pillow takes up most of the space on the bed depending on the one you choose. Some of these pregnancy pillows can be used even after your baby is born, it can be wrapped around you to support your baby during feeding and bonding time. It can also be shaped so that your baby can have a comfortable and cozy sleep. You may also find it useful as a back support when sitting or reclining. Which Pregnancy Pillow is best for me? Choosing the right pregnancy pillow is also important so it is wise to do some research before heading out and buying one. You need to ask yourself some questions. What are your specific needs at bed time? Answering this question will help you to pick the right pillow to suit your needs. 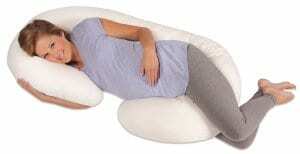 A U shaped pregnancy pillow is the most commonly used one and famous among pregnant women. There are some pillows that are bulky and take up some amount of space, so consider the size of your bed as well when choosing one. Some pillows have the shape of a V which can easily fit between the legs and provide support for the head and back as well. Some have contours to the shape of the body, while there are others that are a simple wedges that can be placed under the tummy for extra support. It’s best to choose the pillow that best provide the support that you desire. Every woman is different and respond to things differently, some might like the pillows while others might not. Some may find the pillows useful throughout pregnancy while others may find it becoming uncomfortable after 34 weeks. Whatever your needs are, always choose what is best for you.